Today we will talk a little about archeology. Usually this science is associated with digging up something very old to see if it sheds any light at the past historic events or the way we interpret them. A while ago I had a chance to work at archaeological sites myself. But girls usually get a sad lot of dusting, washing and sketching tons of broken dishes. I even found a skull once, but that was nothing compared to finding a coin – the real archeological treasure! Generally, a big amount of ancient stuff being studied sticks above ground, there is no need to dig it up. Moreover, it indicates potential sites for further research. Like an ‘X’ that marks the spot. However, even a greater part of some ancient treasures is still covered by dust of the ages. So, it seems impossible to find something hidden underground without knowing where exactly to dig. But no. Oftentimes we need to see things from far to have a better look. This is where remote sensing comes in handy. Populated areas in certain regions are often marked by a specific soil type that does not exist elsewhere in the nature. Another example is human influence on the terrain which is hardly noticeable on the spot. 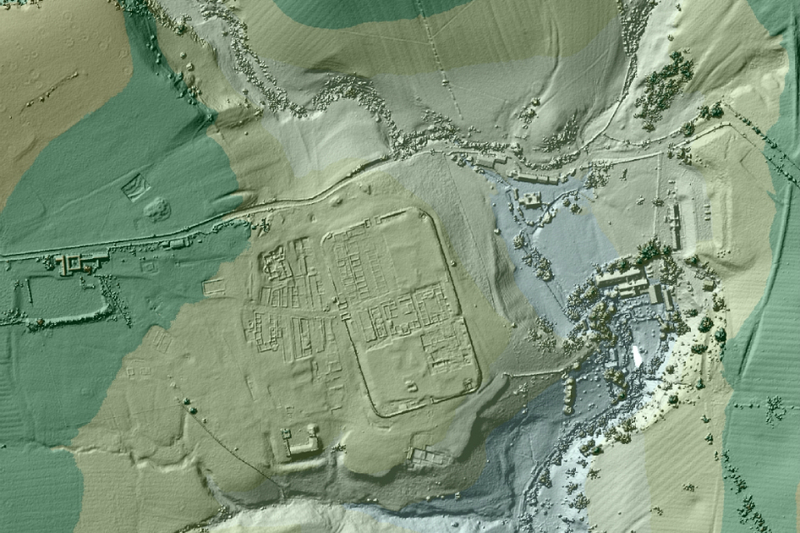 Very recently there had been a new discovery in the UK – “lost” Roman times roads were revealed. It was LiDAR data made public by the Environmental Agency that helped the scientists to make this discovery. By the way, the data is available here. The Romans are well known for making things to last. However, two thousand years is a long period, even for them. So, it was difficult to locate the lost roads at ground level. Similarly with the aerial imagery, it proved to be a hard task, as the small terrain changes are covered by vegetation most of the year. Whereas a fine scaled terrain model enabled tracing specific levelled thin long features, spanning for several kilometers. These features were the Roman roads. In 2015 LiDAR technology coupled with geophysical research revealed a series of new structures in vicinity of Stonehenge, that are still covered by ground. Durrington Walls is a Neolithic settlement surrounded by a bank and a moat of about 1,5 km diameter. Now it appears that the bank soil covers massive stones placed in a semi circle. Stonehenge Hidden Landscapes Project team from Ludwig Boltzmann Institute has used a multi sensor non-intrusive approach to map a hidden henge, as well as other monuments. “Our high resolution ground penetrating radar data has revealed an amazing row of up to 90 standing stones a number of which have survived after being pushed over and a massive bank placed over the stones. In the east up to 30 stones, measuring up to size of 4.5 m x 1.5 x 1 m, have survived below the bank whereas elsewhere the stones are fragmentary or represented by massive foundation pits,” says Professor Neubauer, director of the LBI ArchPro. The multisensor approach combines remote sensing data, geological prospection, using LiDAR, microwave radar, magnetometer, EMI. It seems they have very good funding and using it for a state-of-the-art research. Going back to passive remote sensing we must mention a research by two scientists from MIT and Harvard University, Bjoern Menze and Jason Ur, published in 2012. These guys elaborated an algorithm to evaluate time series of multispectral images coupled with a digital terrain model to classify probabilities of archeological site locations. The approach is developed for ancient Mesopotamia region, this territory has specific features that can be sensed remotely. The algorithm is using the spectral characteristics of anthropogenic soils (anthrosols). These are composed of organic waste, decayed mud-brick architecture, this makes the soil texture and reflective properties differ greatly from the background features. The other characteristic feature is the terrain. The main building material in those ancient time was mud-brick. When the old buildings became hard to live in they were torn down, leveled to the ground making space for new buildings. This way as thousands of years went by populated villages and towns were growing up above the sea level. So, these two peculiarities – anthrosol and terrain – were used by the scientists to locate ancient settlements in their study region. A series of multispectral data from ASTER is used together with CORONA mission data (active in 1960-1970) and SPOT data. For terrain studies SRTM mission’s digital elevation model was used. Three standard vegetation indices were used (NIR/V; NIR−V; (NIR−V)/(NIR+V), V – visible channel, NIR – near infrared). The correlation of the spectral characteristics with different template spectra from the “ASTER SpecLib” representing soil types, water, minerals, and vegetation was also considered. This research made it possible to map about 14,000 settlement sites at 15-m resolution in a 23,000 square kilometre area in north-eastern Syria. At some point Sarah Parcak was dubbed as “the modern Indiana Jones” or “Indiana Jones in a skirt”. Not only she does scientific research, but also tries to make the science more popular. One can argue that her approach is a little too ‘pop’, although by calling her activity “space archeology” she makes it more comprehensive for people. In 2012 Sarah spoke at TED and told how remote sensing helps modern archeologists to make new findings. The scientists had used NASA data to locate former Nile bed and conducted spatial analysis to find where the ancient Egyptian city of Itjtawy possibly stood. The archeologists used clues that the city was located in vicinity of the Nile river and on elevated terrain. One of Sarah’s most recent discoveries made with satellite imagery is a potential second Viking settlement in North America. In February 2015 Sarah became a TED Prize winner and is to receive $1 000 000 to implement her project. That’s quite an amount! This winter Sarah Parcak has announced what exactly the money will be spent on. One of the most troubling things for scientists recently is the rise of looting and destruction of archeological sites, black market sales of artefacts. Egyptian uprisings, devastations by ISIS (latest satellite imagery reveal what had happened to ancient Palmyra), destructions of monuments in Central America – these things are a big concern for Sarah Parcak. So she has decided to counteract the looting and destruction and to further develop archeology. Her solution is a crowdsourced platform to search and protect ancient sites using satellite imagery. The project is called Global Xplorer and it will be launched later this year, but anyone can already join in and wait. Here’s how it’s going to work. The scientists will process the imagery and make it available for the volunteers. Then each volunteer would get a work area to look at with some samples of what to look for. The users will tag images, after an image is over viewed by several volunteers it will be forwarded to an archeologist for verification. At the moment the Global Xplorer team are planning to pass visual examination tasks to their volunteers. This is believed to be the most time-consuming and eye-tiring task that seldom gives results. For the idea to succeed they need a big number of users willing to do this job, so the risks are high. We are very curious if this archeology crowdsourced platform will become popular as, say, OpenStreetMaps. I’d like to point out a difference here. Anyone can see the input they make into OSM on the map itself – that is truly inspiring. We will find out how Global Xplorer developers will tackle this issue. We just need to wait and see. Sarah Parcak hopes that this project will give much needed help to the archaeologists – thousands of eyes that will reduce the load of routine tasks from specialists. At the same time I’d really like to see some image analysis, automated classification techniques that the volunteers would use. This way ordinary people would take park in scientific work, get new knowledge about remote sensing. Space archeology is not as simple as staring at nice pictures taking from very very high above.